Dear ada posted on this amazing centerpiece made with fake birds. You could do something similar with some branches and fake birds from Pearl River Mart, which cost between $14.00 to $30.00 for a dozen. 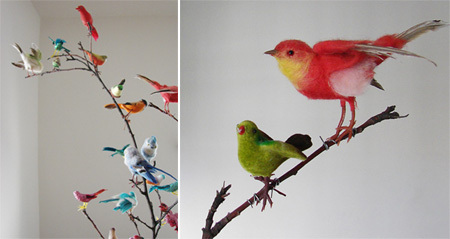 You could also make your own felted birds, but it looks tricky. Incidentally, the centerpiece’s creator, Abbey H., writes Aesthetic Outburst, a blog overflowing with vintage and handmade inspiration. Definitely one to bookmark. I love the Design*Sponge d.i.y. series, which premiered with these wine crate display boxes (left). Every project looks both stylish and doable. The series’ authors also run the excellent Curiosity Shoppe, which I profiled last May, and also worked with Todd Oldham and ReadyMade magazine. Finally, Bloesem found a nice revamp idea involving a lamp shade and an old calendar. we like the DIY Projects, nice to meet you and your blog.